A must-have volume for collectors, history buffs, students of Americana, automotive fans, and anyone interested in the "highway that's the best"
As the highway that helped open up the West to millions of travelers since its construction in the 1930s, Rte. 66 is an iconic road that epitomizes automotive history and culture, and has been celebrated in story, song, films, etc. Justly known as "The Mother Road," this highway became the vital path for travelers, tourists and fortune-seekers who followed the allure of the West. However, after the advent of the superhighway and the Interstate system of the 1950s that fueled America's thirst for high-speed travel, Rte. 66 gradually fell out of use over the years, leaving behind fascinating relics of a bygone era--roadside attractions, marvelous kitsch, storefronts, billboards and signage, particularly the great neon artifacts that still light up the night along the highway. Terrence Moore has loved and traveled and photographed this road since his teens when he first drove it with his parents in the 1960s. Having covered this subject for over 40 years as a professional photographer, he has had his images collected in dozens of calendars and published in numerous publications--yet never before in a book form. 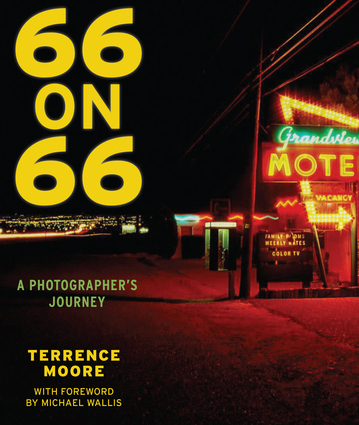 66 on 66 is a collection of 66 of his finest images culled from the thousands he has made over the years, using 35mm color film. The resulting volume is a loving and visually stunning chronicle of this storied road in all the states from Missouri to California in vibrant color that is certain to be a treasured volume for collectors, history buffs, fans and students of Americana, automotive fans and anyone interested in the "highway that's the best."